This project was one of our Pre-K teacher's projects. 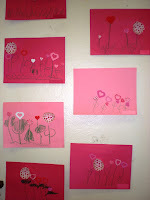 They looked really cute on the wall so I wanted to share them with you. 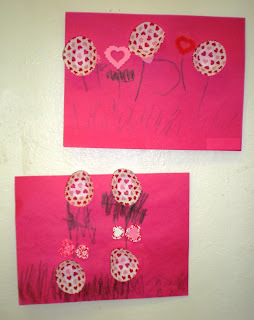 The children decided what type of flowers they wanted to make. Glued down the foam pieces and/or cupcake liners, then drew flower stems and leaves. I espcially liked how the cupcake flowers turned out. We've have made these "flowers" in the spring. I love a colorful classroom! They did a great job with the Valentine flowers.